The more interesting question is whether this was a seasonal bump or the start of a bigger trend. On that front, Kantar is bullish on Apple’s overall lineup that includes older models, especially in comparison to the selection of Android devices available. “In the US, Apple iOS overtook Android for the first time since this time in 2012, albeit by the slimmest 0.1% margin,” writes Carolina Milanesi, chief of research at Kantar Worldpanel ComTech. “While the success of the iPhone 6 and 6Plus is unprecedented, this quarter’s performance also points to Apple having its strongest portfolio ever. With a range of devices available at different price points in both contract and pre-pay, Apple was able to take advantage of a weaker Android offering at the premium end of the market.” Worth also pointing out that Kantar was able to track Apple’s momentum several months ago from initial iPhone 6 sales, and saw it developing in subsequent weeks. Rounding out sales, Microsoft’s Windows Phone is facing a difficult time breaking into anything beyond a negligible place in the market. Across the “big five” markets of Germany, UK, France, Italy and Spain, which was seen as the focus of great hope for the brand considering its Nokia legacy, Windows Phone declined one percentage point and took just under 9% of sales. “Windows Phone, soon to be Windows 10, had seen some success across Europe in 2013 but continued to struggle in the latest period, recording minimal growth only in France and Germany,” Kantar writes. That was repeated elsewhere. In the U.S., dropped by half a percentage point to 3.8% of all sales. In China it is now at 0.7% of all sales. Considering that it wasn’t too long ago that Symbian was China’s biggest smartphone platform, and before that the world’s, and that Windows Phone was supposed to be the heir apparent to Symbian, it’s a remarkable failure to hold on to market position. But in that push of consolidation around two platforms, it’s not the only one to fall away. BlackBerry isn’t even broken out by Kantar anymore. Within Android’s sales, Samsung continued its pole position, with its Galaxy S5 as the second-most popular smartphone after the iPhone. But overall Android saw declines in other big markets. 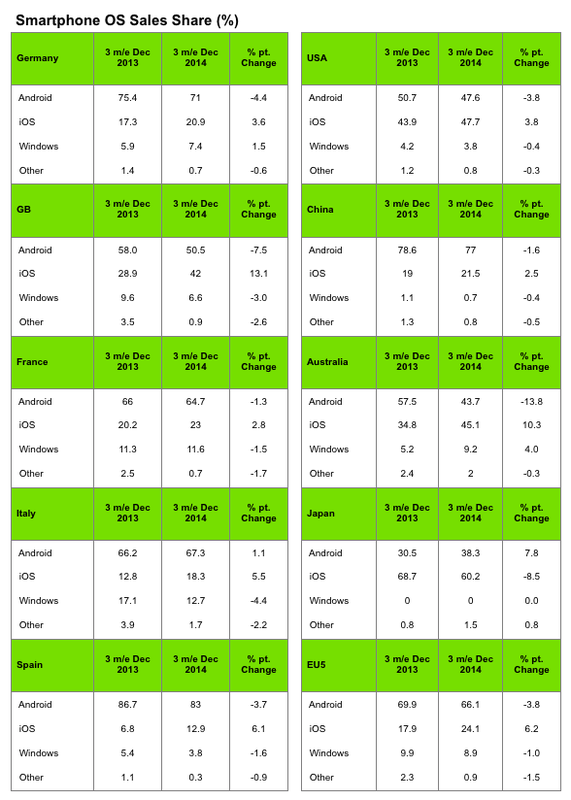 In the big five EU markets, Android’s overall share was down by 3.8 percentage points, the same decline as in the U.S. Notably, in the UK, Apple saw its strongest gain against Android, picking up 13.1 percentage points while Android dropped 7.5 percentage points, with iPhone 6 becoming the best-selling smartphone in Britain with 20% of all smartphones sales (the Galaxy S5 came at a distant second with 8%). Nevertheless, across Europe Android still accounted for just over 66% of all sales through carriers and retail channels. In another key market, China, Apple’s iOS was actually the only platform that saw annual gains for the company. (And indeed, Apple also made a lot of noise in its quarterly earnings about how strong China is for it at the moment, with $16 billion in sales in the market.) It accounted for 21.5% of sales in the quarter to Android’s 77%, fuelled by brands like Xiaomi. “In Urban China, Apple iOS grew share year-on-year at the expense of Android,” writes Tamsin Timpson, strategic insight director at Kantar Worldpanel ComTech Asia. “While Xiaomi remained the bestselling brand in the latest period, Apple was able to close the gap slightly, growing its share to 21.5% from 19% last year.” China, it should be noted, is still a market with room to grow, unlike the very saturated European and U.S. markets. Kantar notes that one-quarter of Chinese consumers who bought an iPhone in the past three months were acquiring their first smartphone, compared to 16.5% for the same period in 2013. Indeed, in the U.S. Kantar says that smartphone penetration is now 59% and in Europe it is 67%. In contrast , Brazil’s penetration is only 35% and Mexico’s is 37%. This is where brand loyalty continues to be an open game. “As the opportunity to attract first-time smartphone buyers in developed economies diminishes, retaining loyal customers is becoming as important as winning them over from competing platforms,” says Milanesi. She notes that Apple’s average customer loyalty in the U.S. and Europe is currently a “promising” 87%, while Samsung continues to hold on to the strongest Android brand.